If you want a true memory foam feel that isn’t too warm than take a look at the Cocoon Chill. 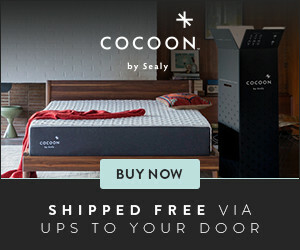 Sealy’s bed in a box brand, Cocoon, offers two mattresses. Their Classic Cocoon, a more budget friendly option. And the Cocoon Chill, their answer to heat retaining memory foam. Both of these also come in two firmness options with a softer and firmer feel. This makes finding your perfect memory foam mattress as easy as can be. The Cocoon Chill is made of three layers of foam to create 10″ of thickness. 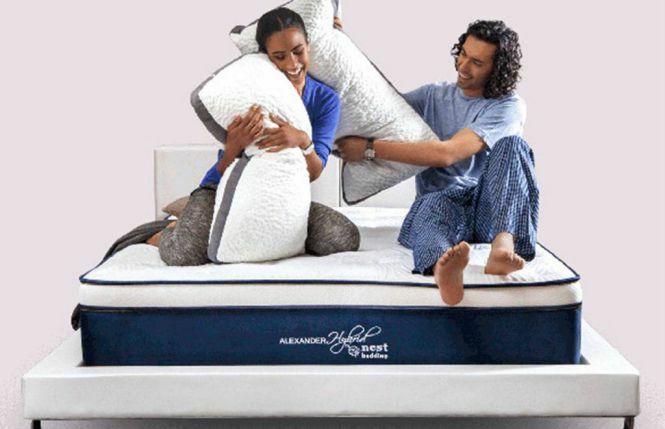 The top 2″ are a very contouring and hugging memory foam. Either being a bit softer or bit firmer depending on which option you go with. Under this is transition comfort layer. This layer is great for evenly distributing weight and provides deep comfort too. The base of this mattress is 6″ of dense base foam that creates a solid ad supportive foundation. All of this is covered in a durable yet cool to the touch smooth finished cotton blended cover. Making this mattress the perfect combination of materials for a restful nights sleep. Not only do you get the solid reputation of Sealy with this mattress but you also get free shipping. This USA made mattress also has a 110 night sleep trial and 10 year warranty. If you want a durable and comfortable memory foam mattress that doesn’t sleep too warm, than Cocoon Chill is for you. Also, save $100 on any Cocoon mattress, including the Chill with our exclusive coupon. Just click the image below and use the code: OSG100 when purchasing. Below we have our detailed written review for the Cocoon Chill by Sealy mattress. We will go through how it performs for off gassing, comfort, motion transfer, sleeping cool, edge support, value, material, trial and warranty. The Cocoon Chill is made in the USA. It is roll packed and shipped for free right to your door. Once you get the mattress it may take two people to move the 60+lb box to your room. Once there the unboxing process is quite easy. Just remove the mattress, unroll and cut the plastic open and wait for it to expand. It may take a few hours to fully expand, and up to 24 to 48 hours to fully firm up. But you’ll be sleeping on it in no time. While unboxing and taking your new mattress out of the tightly wrapped plastic there will be some scent that dissipates. This off gassing will be minimal and should air out quickly. This mattress is again made in the USA which helps keep any noxious odors to a minimum. Many times the scent you will be smelling is from the plastic enveloping the mattress opposed to the mattress itself. Regardless, letting the mattress breathe for several hours before putting sheets or a protector on is a good idea. Also, if you are more sensitive to smells having a window open will also help. See how easy it is to unbox the Cocoon Chill by Sealy in our video below! 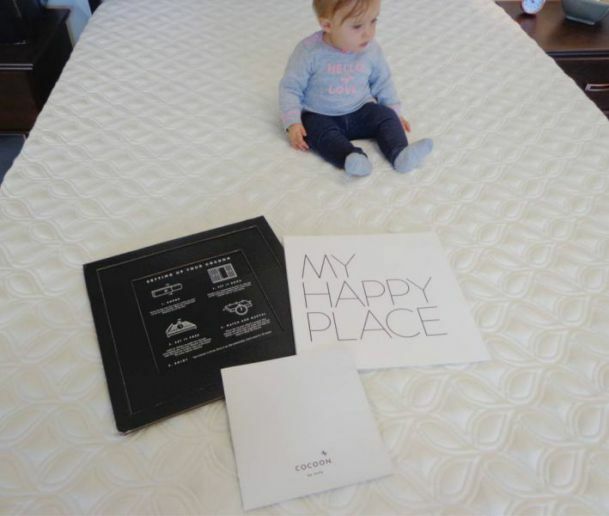 Your new Cocoon mattress will need to be set up on a nice flat and even surface. The foundations you can use with this mattress include a box spring with or without a frame, an adjustable base, a platform bed or slatted bed. There are several options available and finding the one that works best for you is key. However, Sealy also offers a Cocoon Foundation that matches and works perfectly with this bed. Sealy’s bed in a box is very supportive and cocooning memory foam mattress. Hence the name Cocoon. The Cocoon Chill is available in two firmness levels. A soft as well as a firm option. This allows for two ideal feels depending on which positions you sleep in as well as your preference. On a firmness scale the soft will fall around a 4.5 to 6. This is more of a medium-soft to medium feel and ideal for memory foam. You don’t want memory foam to be too soft or it will feel like quick sand and leave you stuck. This option allows for you to be cradled by the comfort layers but not so soft that you loose support. This option is great for side sleepers as well as back sleepers too. It also is there most popular feel and most ideal for couples as well. It is even firm enough to work well for stomach sleeping too. The firm will come in around a 7.5 to 8 and is a true firm feel. This is a great option for dominant stomach sleepers and back sleepers who like more support. This will also be a great option for heavier sleepers as well. Most memory foam mattresses do feel a little less firm when you are heavier, so this will feel more like a medium firm to larger sleepers. Both of these options will offer great support a perfect pressure relieving feel. We tried the Cocoon Chill in the soft option and found it to be a true memory foam mattress with all the benefits expected. The soft had plenty of support and wasn’t too soft, but just soft enough to easily hug your body. The feel was more of a medium soft feel that still accommodated all sleeping positions. It did a great job of evenly distributing weight and was really nice for side sleeping. The Cocoon by Sealy will do great for minimizing motion transfer. It has a combination of dense memory foam, comfort transition foam and solid base foam. They all work together to make for little to no partner disturbance. This all foam bed will absorb most movements and work great for even the lightest sleeper. It also is ideal for anyone who shares a mattress, is a restless sleeper or just wants a mattress that is great at isolating motion. The Cocoon mattress offers a “Chill” option specifically designed to help keep you cool. This option features a different cover made with a thermic phase changing material to help dissipate heat. Another quality that helps with sleeping cool is the option to have a firmer mattress. A firm mattress will help you sleep “on-the-bed”, where as a soft mattress will feel like you are “in-the-bed” which can add to the warmth. We tried the Cocoon Chill in the softer feel. The cover was definitely cool to the touch and does a good job of providing that cool feel . Especially when you initially getting into bed. It does become less a little less cool after sleeping on it for several hours, and the soft option does cocoon you more. If you choose the firm option and chill cover, this mattress should stay temperature neutral and be the best option for sleeping cool. Edge support is key for two reasons. One being able to fully use the mattress from edge to edge for sleeping. The other is for the occasional sitting on the edge. For both purposes you want a solid, durable edge that will create a consistent feel as well as function as you need it to. The Cocoon mattress uses dense materials from the durable base foam to the solid memory foam. This creates not only an even feel from every angle but also edges that feel more stable as well. For sleeping this mattress is fully usable and sleeping on the edge or the middle you should feel very little difference. The Cocoon has a very even and flat surface that slowly responds to your weight but it is very nicely supportive too and doesn’t collapse under you, especially when your weight is evenly distributed. Sitting on the edge you will notice less support with all your weight in one spot. This is fairly typical, especially for all foam mattresses. However, the Cocoon did okay for sitting and if used for minimal sitting will be just fine. The price for the Cocoon Chill by Sealy comes in at $949 for a queen size. After our exclusive coupon though it is ONLY $849! This price also includes a 10 year warranty, 100 nights to try out the mattress as well as free shipping. For a true memory foam mattress that feels dense and solid as well as ideally pressure relieving this bed comes in at a good value. Not only do you get a great memory foam feel, you also have minimal motion transfer, a fully usable sleeping surface and a technology driven cover that will help keep the mattress cooler. To top that off we also have an exclusive $100 off coupon to make the value even better. Just click the image below or go to cocoonbysealy.com and use the code: OSG100 to save instantly. *Also, if you are less interested in the cooling aspects of this mattress and having a lower price point that make sure to check out the Cocoon Classic mattress. And if you are in need of financing Cocoon by Sealy also offers payments that can be made over 12 months. The Cocoon Chill by Sealy is a 3 layer mattress that is 10″ thick. The top layer is 2″ of Perfect Fit Memory Foam. This layer is great for maximum pressure relief and providing ideal contouring and hugging. It is adaptable and slow responding to let you slowly sink into the mattress. The second layer is a 2″ of Comfort Transition Foam. This foam helps create an even transition between the top comfort layer and denser base foam. It also is great for evenly distributing weight as well as providing deep comfort. The foundation of this mattress is is 6″ of Dense Base Foam. This creates the core of the mattress and will provide the bulk of the support. It is also a thick dense layer that will provide durability and longevity. The smooth cool to the touch cover is a blend of cotton and polyester that also has a phase changing material. This added feature keeps you cooler as well as quickly wicks away moisture. It is soft & breathable cover that is also very aesthetically pleasing too. The Cocoon Chill by Sealy mattress has a 100 night sleep trial period. This is the online mattress industry average and what is typical offered. This trial period allows for a sufficient amount of time to see if this mattress is a good fit for you and also has a very easy return process if it isn’t. The Cocoon comes with a 10 year warranty. Like most mattress warranties the 10 year Sealy warranty is prorated to coincide with the natural average wear of the bed over time. This warranty is fairly standard and provides consumers with the confidence that this is a product that the company will stand behind. 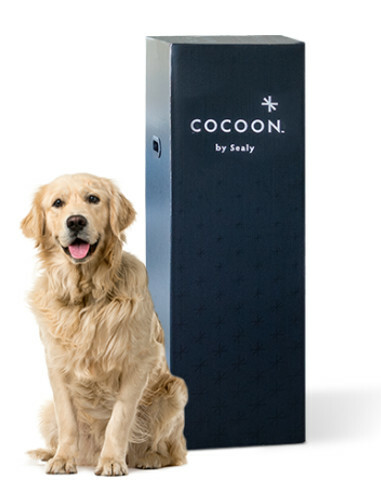 If you are looking for more specifics for the Cocoon by Sealy trial period & warranty find out more at cocoonbysealy.com or for a helpful tool check out Our Mattress Warranty & Trial Period Guide. We know that the Cocoon Chill by Sealy is a great mattress. But, don’t just take our word for it. See all the happy Cocoon customers below! “Have not slept on it very long, but such an improvement over old mattress. The Cocoon foam is the real deal…the material is amazing and enables me to sleep much deeper, decreases fatigue, and body feels less stiff when I wake up.” – Tony G.
“For my first bed in a box, I think I chose wisely. I did some research on the many box mattress options and considered some other well known brands but ended up getting this. Good packaging, but also easy to unwrap. Bed ‘inflated’ in less than 30 minutes. Very comfortable. Mine is the firm version.” – Sean F.
“Slept on one of these when I visited family in Alaska and slept so good that I purchased one when I got home and I slept for 10 hours the first night. I can’t tell if the chill portion is a plus or not because the one my niece had was the classic soft but I get hot at night so I put the extra out for the chill classic and I sleep the same on both. A great nights sleep for sure.” – Diana J. “I let out a sigh of relief every time I get in bed. Sleeps cool for a memory foam mattress. 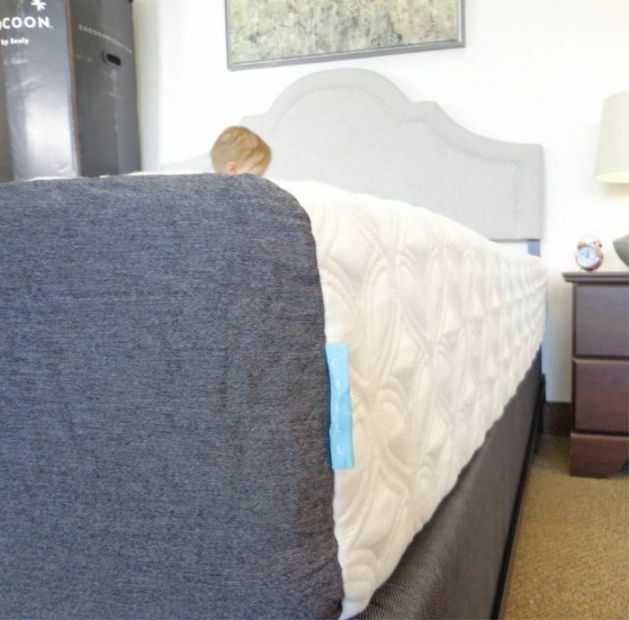 We love it.” – Art R.
It doesn’t stop at the Cocoon Chill by Sealy mattress review! 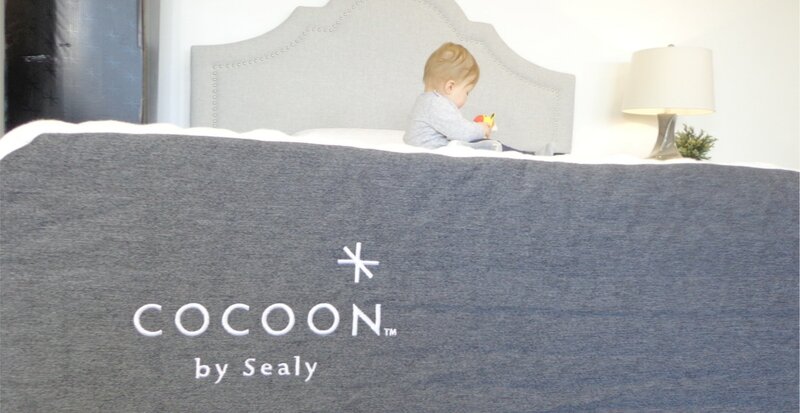 Make sure to check out the other Cocoon by Sealy mattress, the Classic; HERE! 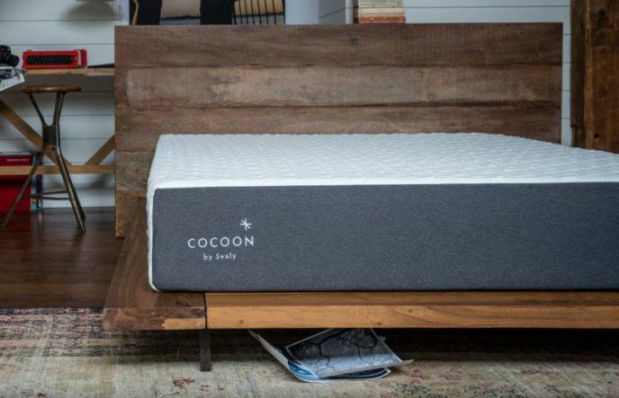 Also when compared to other brands the Cocoon by Sealy mattress really stands out. Check out some oft he comparison reviews it is featured in. Including the Cocoon vs Casper, Cocoon vs Puffy, Cocoon vs Leesa, Cocoon vs tulo, Cocoon vs Purple and Cocoon vs Nolah. The Cocoon Chill by Sealy provides a dense and true memory foam mattress at a great price. Adding the phase changing cover makes this mattress a better choice for warmer sleepers. And the durable materials make this a mattress that will be comfortable for years. You like a true memory foam mattress available in two firmness levels. You want a mattress that has good motion isolation, sleeps fairly cool and is durable and solid. You like having a brand that is recognizable and has a great reputation. You want a mattress in a good price point that will get you a great night sleep. Still looking for some more information? Visit Cocoon by Sealy at cocoonbysealy.com. Also, have questions for us? Please contact us and we would be happy to help you!